When Mitch and I were in college down in Pensacola, FL, we went to an Ice Pilot's game with some friends. The Ice Pilot's are a minor league hockey team. Mitch is a huge hockey fan for those of you who don't know. (GO FLYERS!) He grew up in Canada and pretty much learned to skate while learning to walk. Okay maybe not that soon, but you catch my drift--huge hockey fan. 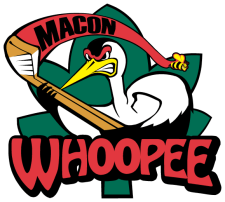 Anyway, so we were at this Ice Pilot's game and the team that they were playing that night were called the Macon Whoopee. I'll never forget that name. So needless to say we were crackin' jokes all night long and still do on occasion. According to food historians, Amish women would bake these (known as hucklebucks at the time) and put them in farmers' lunchboxes. 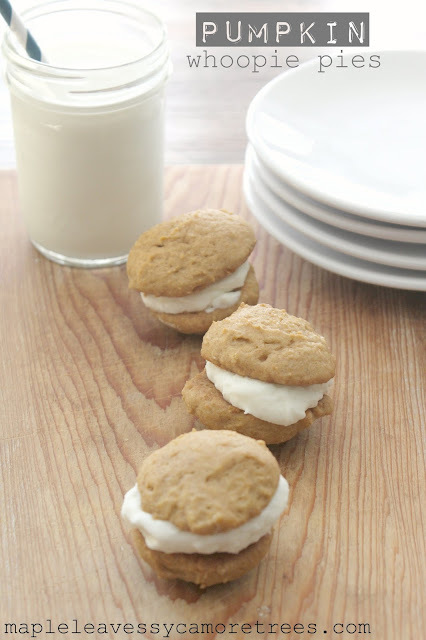 When farmers would find the treats in their lunch, they would shout "Whoopie!" There's your fun fact for the day, folks. But anyway, this whole post does have a point to it. Ryder and I made Whoopie Pies yesterday. I didn't want to make the chocolate ones considering I'm not a fan. So I searched for a recipe on allrecipes.com and found one for cute little mini pumpkin ones. I am a fan of all things pumpkin. And let me just tell ya, they're bangin'. The filling is made of cream cheese and buttah. Can't go wrong with those two. I didn't have quite enough cream cheese--I think I had 3 oz instead of 4 but they still turned out like little gems. Oh and I didn't put the ginger in since I don't have any. They're the perfect size too. Yum-o. For cookies: Preheat oven to 350 degrees F. Lightly grease or line four baking sheets with parchment paper. Yummy!! I cheat on my chocolate woopie pies. I just take a chocolate cake mix add an extra cup of floor and prepare according to the box. Super easy and simple, and then my own buttercream frosting in the middle. Willie would pick your any day over chocolate ones - maybe I will give them a try. Those look really good and oddly enough I think I have all the ingredients already! Wowzers those look GOOD! I think I'm going to have to make those. The three old and hubby will love them! Oooh yum!! Thanks for sharing! I'm ready for one of these right now! Please share your amazing recipie with our readers by linking it up at Muffin Monday. Thanks! Thanks so much for linking kup at Muffin Monday! Hope to see you again next week. 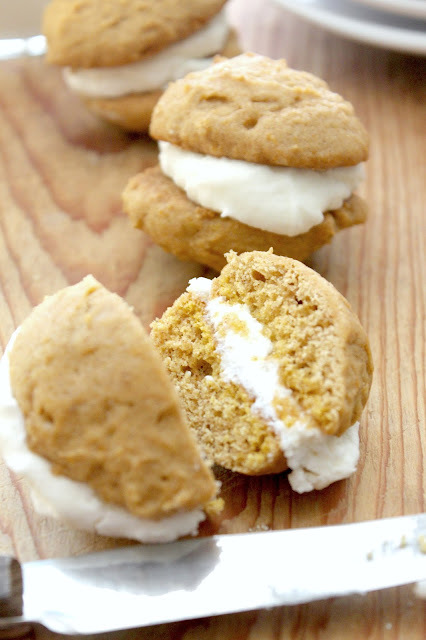 I don't really care for whoopie pies either. However, I did make some this past week for a Fall themed recipe club. They were chocolate with a pumpkin filling. The filling was delicious!